Robert Robinson Taylor is featured on a US Postal Service Stamp but you might not have heard of him. He is one of the earliest African American architects, and the first black man to graduate from the Massachusetts Institute of Technology (MIT) in 1892. 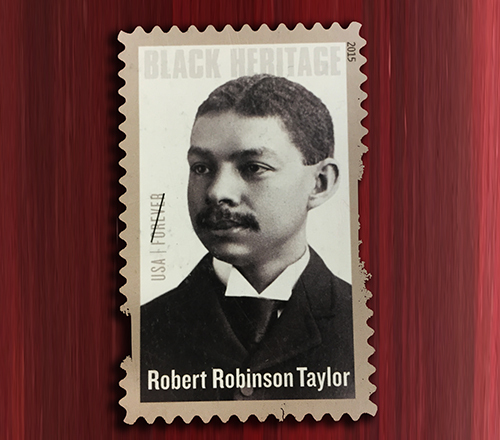 Originally from North Carolina, Taylor was the son of a slaveowner and a black mother. He had a successful career as a ship builder, as well as a builder of , well, buildings. It seemed odd that he would want to go up to Boston to attend MIT and to be southern and black – but he went anyway and was very successful, earning scholarships and getting good grades. After graduating, he returned to the south and worked as a professor at the Tuskegee Institute in Alabama, one of the historically black colleges. One of the buildings on campus of Tuskegee was “Science Hall,” now renamed “Thrasher Hall.” Interesting to note, the brick structure was designed by Taylor, constructed by the students, and even the bricks were made by the students. Taylor also supervised the construction. There was an emphasis at Tuskegee to illustrate that black men could perform physical labor and skilled building trades and thus they would be great men to hire and work out in the world. Taylor also wanted these men to understand the skills of architectural design. This was all happening after slavery ended, when there was a need to offer skilled, industrial training to these men who had never had that opportunity. The most famous building on campus designed and built by Taylor and his students was the Tuskegee Chapel, but sadly it burned down in 1957. Read more details about Mr. Taylor at MIT.